If you are considering a Planet Fitness franchise, don’t get blindsided by these 26 important franchise fees (from the initial franchise fee, to the royalty fee, to 24 other fees found in Items 5 and 6 of Planet Fitness’s 2018 FDD). You will pay a lump-sum Initial Franchise Fee in the amount of $20,000 when you sign the Franchise Agreement. The Initial Franchise Fee is uniform and nonrefundable. All initial fees are the same for both initial and conversion franchises. If you acquire rights under Planet Fitness’s Area Development program, you will pay an Area Development Fee equal to $10,000 per location to be developed under the Area Development Agreement when you sign the Area Development Agreement. The Area Development Fee is uniform and non-refundable. The Area Development Fee is in addition to the then-current Initial Franchise Fee due for each location at the time the Franchise Agreement for that location is executed. If you sign an Area Development Agreement, the Initial Franchise Fee for each location opened under the Area Development Agreement will be $20,000 for Franchise Agreements entered into within four years of the effective date of your Area Development Agreement. After four years, the Initial Franchise Fee for each location opened under the Area Development Agreement will be equal to the then-current Initial Franchise Fee being charged to new franchisees. You must commit to opening one or more Planet Fitness locations as a condition of acquiring area development rights, either yourself or through one or more entities in which you own 51% or more interest. When payable: Paid monthly and annually. Your Royalty payment is currently based on the total gross monthly and annual membership fees for the Planet Fitness business that are due and payable to you each month and annually, as applicable, by or on behalf of your members through authorized EFT withdrawals (the “EFT Dues Draft”), regardless of the amount of membership fees you actually collect. When payable: When underlying obligation is paid. 18% (annualized) or the highest contract rate of interest permitted by law, whichever is lower. Paid to Planet Fitness for the administration of customer memberships and providing balance payment options for your franchise location based on information submitted to Planet Fitness via the Internet. When payable: As Planet Fitness and you agree. Payable for any refresher training courses for previously trained managers that Planet Fitness may require, or operational training for new managers as you may request. The cost of refresher training varies based on the number of people trained and the length of the training. Refresher training is held at the Planet Fitness headquarters or a predetermined location. You are responsible for your travel, food, and lodging expenses incurred in connection with any refresher training. 6. Per Diem Fee: $100 to $1,000. Will vary under the circumstances. You must pay Per Diem Fees in connection with additional or special operational training for your managers that you request. The amount of the Per Diem Fee varies based on the number of people trained, and the length and location of the training. You are also responsible for travel, food, and lodging expenses for Planet Fitness’s personnel. You must maintain your equipment according to Planet Fitness brand standards. This includes replacing your cardio equipment every 5 years, and replacing your non-cardio equipment every 7 years. Planet Fitness estimates the total costs to re-equip your facility with both cardio equipment and all other exercise equipment will range from $314,000 to $922,000 every 5 to 7 years. Your actual costs may be higher or lower depending on the size of your Planet Fitness business, the volume and usage of your members, or changes in the market. You must maintain the franchise premises according to Planet Fitness brand standards. This may include substantial remodeling of your premises as frequently as every 5 years. 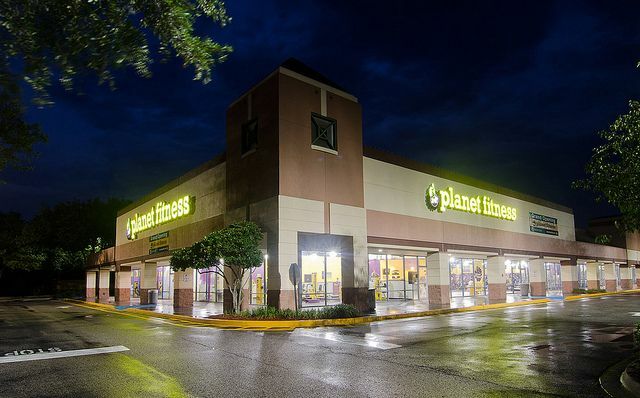 With the exception of signage, Planet Fitness will not require substantial remodeling more often than every 5 years during the term of the Franchise Agreement. Planet Fitness estimates the costs to upgrade and/or remodel your facility will range from $70,000 to $600,000 every 5 years. Your actual costs may be higher or lower depending on the size and location of your Planet Fitness business. If you fail to obtain the required insurance coverage for the franchise, Planet Fitness may obtain coverage for you at your expense. When payable: When the Royalty is paid. When payable: Expended quarterly according to Planet Fitness’s Methods of Operations as per your advertising budget. Paid by you to advertisers. If you own and operate multiple Planet Fitness businesses in the same market area and LAF spending for them is combined, you will be in compliance with the LAF requirement if you spend an amount that satisfies the LAF obligations for all of the Planet Fitness businesses in the aggregate. Paid to Planet Fitness or third parties. You must participate in and contribute funds to special marketing programs and campaigns that Planet Fitness develops and administers from time to time. Your required contribution to the special marketing program will not exceed the then-current collective required monthly NAF and LAF payments (currently, 9% of EFT Dues Draft), and if Planet Fitness requires you to pay the special marketing program fee, you will not be required to pay a separate LAF or NAF for the corresponding month. The price you pay for Special Marketing Programs may be more than cost. When payable: After inspection or audit. You must reimburse Planet Fitness for its auditing costs if it has to audit you because you fail timely to provide it with required reports. When payable: Prior to or concurrently with transfer. Paid to Planet Fitness in the event you want to transfer the franchise. If the transferee is (a) one of your owners, (b) a family member of one of your owners or an employee of the business and the transfer is of a non-controlling interest in you, (c) an entity controlled by one of your owners and for estate planning purposes, or (d) a third-party, but the transfer is of a 5% or smaller ownership interest in you, Planet Fitness does not charge a transfer fee, but you must reimburse it for any outside legal and administrative costs. Paid to Planet Fitness in the event you want to transfer the development rights. If the transferee is (a) one of your owners, (b) a family member of one of your owners or an employee of one of the businesses developed under your Area Development Agreement and the transfer is of a non-controlling interest in you, (c) an entity controlled by one of your owners and for estate planning purposes, or (d) a third-party, but the transfer is of a 5% or smaller ownership interest in you, Planet Fitness does not charge a transfer fee, but you must reimburse it for any outside legal and administrative costs. When payable: Prior to relocation. Paid to Planet Fitness in the event you want to move the location of your franchise. When payable: Upon your submission of your Construction Development Plans for Planet Fitness’s approval. Paid to Planet Fitness in the event that you do not use its designated architect during development of your franchise. 19. Point-of-Sale Support, Processing, and Account Management Services Fees: $149-$199 plus processing and credit card fees, based on the number of transactions processed per month or number of eligible accounts enrolled in collections. Estimated annual transaction costs per location range from $9,000 to $72,000. Payable to Planet Fitness’s designated Point-of-Sale vendor for monthly software support, processing services, related security services, and other account management services. Payable to Planet Fitness’s designated Point-of-Sale vendor for onsite training. When payable: Concurrently with Planet Fitness granting a successor franchise to you. Upon expiration of the term of the Franchise Agreement, Planet Fitness may grant you a successor franchise subject to certain conditions. You must reimburse Planet Fitness if it is held liable for claims arising out of your franchise operations. When payable: Payable if Planet Fitness prevails in any legal dispute with you. You’ll reimburse Planet Fitness for accounting, attorneys’, arbitrators’, and related fees and costs incurred by it. You will reimburse Planet Fitness for its actual costs if, after an inspection of your facility, it determines (in its business judgment) that additional follow-up inspections or assessments are required. When payable: Paid monthly via EFT on the day designated as your Monthly Membership Billing Day, as defined in the Franchise Agreement. Payable only if you fail to cure a default after receipt of written notice of default and within the applicable cure period provided in a written notice of default and Planet Fitness agrees to extend your cure period. Planet Fitness may or may not extend your cure period in its business judgment. The Extension Fee is in addition to all regular ongoing fees you must pay under the Franchise Agreement. When payable: Paid monthly beginning on the first day of the Paid Grace Period. The fee applies to each Planet Fitness business you were required to have open and operating under the Development Schedule and is payable during a 6-month period (the “Paid Grace Period”) to enable you to cure applicable development defaults. Planet Fitness may require you to reimburse it for its reasonable expenses, including the costs of travel, lodging, and food incurred in site evaluation for each visit it makes at your request. Planet Fitness estimates its reasonable expenses related to site selection will range from $1,000 to $3,000. If Planet Fitness requires you to pay these expenses, the amounts are nonrefundable. You currently must lease or purchase fitness equipment from Planet Fitness’s affiliate PF Equipment prior to opening your business. Planet Fitness estimates the cost of a down payment to be 10 to 30% of the total amount financed; the down payment typically ranges between $31,000 and $277,000. Planet Fitness estimates the cost to purchase equipment prior to opening will range from $314,000 to $922,000. The lease and purchase costs are non-refundable.